My great grandfather, my grandparents and my father all bought (or got) Omega watches in the 1960s. My grandfather still wears his Omega Constellation (which I reviewed here) and my father owns his grandfather’s Constellation and an Omega Geneve. He doesn’t wear any of them, but a O&W mechanical military style watch instead (I don’t know why). However, I recently took my great grandfather’s Constellation (which was bought in 1965, my dad still has the box, booklet, papers and original bill) with me for a small service. 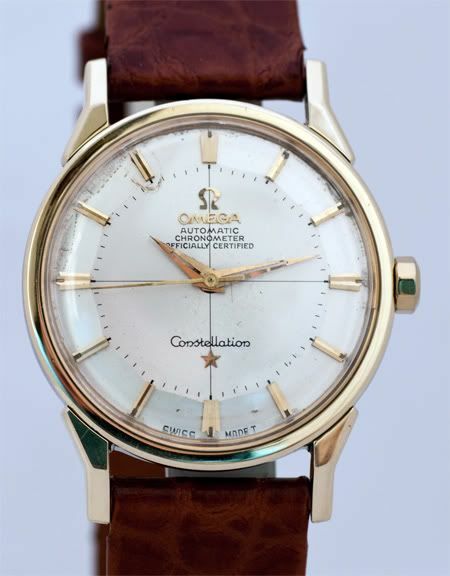 The watch lost its original crown, it was terribly scratched on the caseback, didn’t have an original Omega crystal, the Constellation symbol on the caseback was sitting loose and the original gold buckle was lost long time ago. How come? Well, I guess it must have been somewhere in the late 1970s or early 1980s, it was in the possession of my grandfather at that time, so he had two of them. His own Constellation and my great grandfather’s Constellation. The latter one stopped working at some point. I don’t think my grandfather had (or has) much Fingerspitzengefühl for mechanics, as he used soap/dish water and brush to give it a good cleaning! The watch got water inside and it was ruined. So when he was about to throw it into the trash can, my father saved it and took it with him to see if he could have it fixed (oh yeah, this is a true story). My father took it to a local watch shop (early 1980s) and had it fixed for quite some money. He remembers the shop clerk telling him that he should have kept it in a glass of water when bringing it to him, so he wouldn’t have to worry about any rust. Anyway, the watch got fixed, with a few scars and my father kept it. It was probably at this repair job when the original crystal, crown and buckle got lost. I don’t think it mattered much at that time, since cheap quartz watches were more convenient and there was simply no use for mechanical watches anymore. I am afraid that a lot of similar watches had similar destinies (trash bins). Anyway, a few weeks ago I told him I was probably able to get him the original crown and showed a picture of a similar Constellation with its original crown in the Journey Through Time book, written by Marco Richon of Omega. He was excited about it and gave me the watch to have the original crown and clasp installed. He did, and what a marvelous job! The original plastic crystal has this gold ring that puts it in the right place inside the watch case, it also features the Omega sign in the middle of the crystal. The crown is 14ct gold and fits superb on this watch. The 14ct gold buckle is of an older Omega model, but it does the job. The caseback got polished as well, removing the scratches of a pair of scissors that was once used to open it up to have it cleaned with dish water. The goldcapped lugs and the (solid) gold lunette are still in perfect shape, sharp edges where they belong and shiny on the surfaces. I always had a weak spot for vintage Constellations, but this one really tells a story. Together with the original box, booklet (stamped by Kwekkeboom, who still exist but are no longer Omega dealer) and bill.. I think this is just a little treasure! As you can see, the dial is smudged in the upper left corner, although the photo makes it worse than it is in real life. The tritium in the beautiful gold hands is long gone… Other wise, the watch looks superb again.. The Omega caliber 551 almost got drowned in the late 1970s/early 1980s, but is keeping time fine again. If you are a sucker for these vintage beauties, make sure to check out the Constellation blog by Mondodes.